Acting Prime Minister and Attorney-General Aiyaz Sayed-Khaiyum during second round of roadshows for nurses and civil servants in Nausori on September 19, 2017. Photo: Ronald Kumar. Inefficiencies in ministries like the Ministry of Health and Medical Services were brought to the attention of Acting Prime Minister and Attorney-General Aiyaz Sayed-Khaiyum yesterday. They were highlighted during his roadshow on civil service reforms. The revelations angered Mr Sayed-Khaiyum who shared the frustrations aired by Medical staff regarding their Permanent Secretary and senior management staff. Nurses and staff, who are dissatisfied by the manner their contracts have been treated, called for a complete overhaul of the administrative side of Ministry of Health and Medical Services – from Permanent Secretary level to various senior management staff. These issues should not have come up because they were not policies implemented by Government, but decisions arbitrarily made by individuals within ministries. Contracts about to expire but posts not advertised. 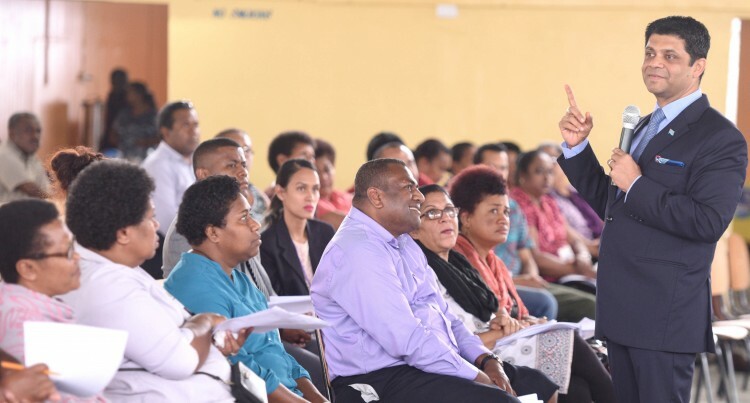 Mr Sayed-Khaiyum apologised to Health and Medical Services staff on behalf of Government and shared the frustration of those who attended the roadshows in Vunimono Hall, Nausori and Khatri Hall in Suva. He was also informed that staff were not paid overtime but were asked to take time off in lieu. and SEG 2 allocations by $14 million and that there was no reason that staff were not paid overtime. These SEGs deal with emoluments. He also highlighted that in Lautoka Hospital, one decision maker had arbitrarily decided that no staff would be paid overtime. Neither Mr Sayed-Khaiyum nor the Health Minister Rosy Akbar was aware of this till the matter was raised with the A-G. He agreed that there was a serious need to look at the Human Resources departments within ministries, including the Health Ministry and that it was the responsibility of the Permanent Secretary to ensure the right people held senior management posts. He was informed by nurses that they had emailed Mr Davies who has only referred their queries to Director Human Resources. Mr Sayed-Khaiyum agreec with the participants that some people holding senior management level positions were not doing justice to their roles. He also informed the staff that six months prior to contracts expiring, positions need to be advertised, so that the incumbents are not caught off guard when their contracts are up for renewal. Mr Sayed-Khaiyum agreed that there were people within some ministries who were deliberately delaying the implementation of various reforms but it was the civil servants on lower levels who were suffering, as a result. He revealed that a senior management staff from the Health and Medical Services Ministry had outright debunked the reforms and contracts. Despite complaints against the staff, no action was taken against her by the Permanent Secretary. Director of the Civil Service Reform Management Unit Jane Curran who accompanied Mr Sayed-Khaiyum for the roadshow also clarified that all contracts had been sent out from her end. Mr Sayed-Khaiyum said he would not only see to it that their issues were sorted out with urgency, but also raised the matter with all Permanent Secretaries this weekend and with the chairman of Public Services Commission, Vishnu Mohan. Mr Davies said last night in forums such as the roadshows where general remarks were made, it was difficult to provide meaningful response. However, he agreed there were some issues where nurses were paid less than what they were supposed to but the ones that had been highlighted, had been sorted out. He further stated that dealing with certain issues were not the job of the Permanent Secretaries but of the Director Human Resources.